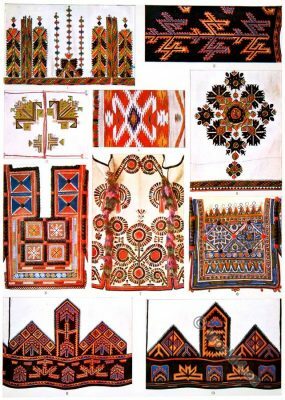 Home » Macedonian embroidered clothing patterns. 1. and 5. Wool embroidery on a woman’s cotton shirt. No. 1. hem, No. 5. sleeve motif, native to Vodna near Skopje, Macedonia. 2. and 9. Wool embroidery on a woman’s cotton shirt. No. 2. sleeve motif, No. 9 hem, native to Romanovce near Kumanovo, Macedonia. 3. Woman’s cotton shirt lower hem embroidery, native to Macedonia. 4. 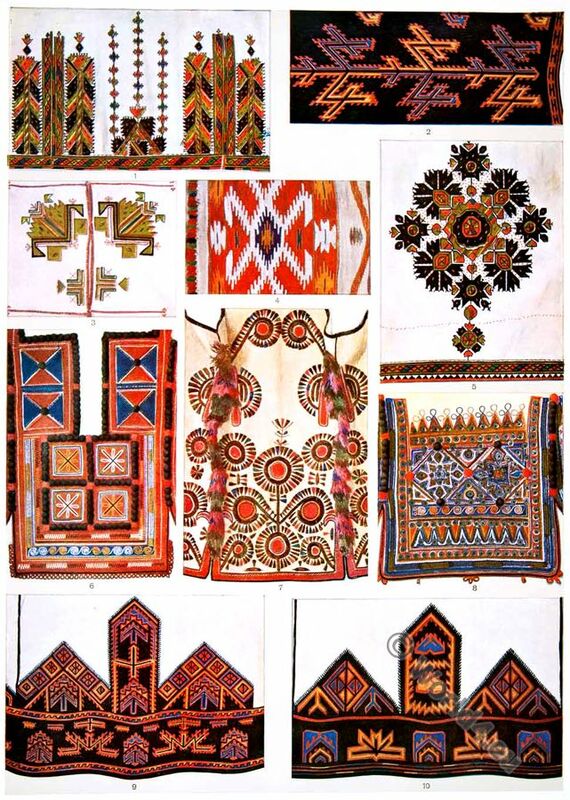 Pattern of a handkerchief, woven in Kelim technique, native to Romanovce near Kumanovo, Macedonia. 6. White felt cloth woman’s jacket back decorated with silk embroidery, native to Kumanovo, Macedonia. 7. White felt cloth woman’s jacket back decorated with silk and wool embroidery with felt appliqué, native to Skopje, Macedonia. 8. Woman’s cotton summer jacket section, decorated with cloth appliqué, gold and silver embroidery and sequins, native to Kumanovo, Macedonia. 10. Woman’s cotton shirt hem, native to Romanovce near Kumanovo, Macedonia. Source: Ethnographic Museum, Zagreb, Croatia. 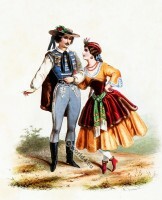 Folk dress. 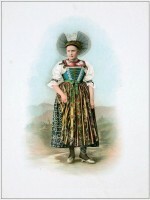 Hunter costume of the Ziller Valley Tyrol. This entry was posted in 19th Century, Embroidery, Macedonia and tagged Macedonian national costumes on 11/6/16 by world4.